We shouldn’t jump to conclusions too soon but given that the MSM has tried incessantly this week to blame the coming of hurricane Florence to the Carolinas on the current White House administration, don’t be surprised that afterwards they will be saddened should it be less of a disaster than expected. Furthermore, should Fema do a better job at helping those affected by this hurricane in the coming days, the MSM will most likely once again point out that this is logic, as it was in a mostly ‘white’ area and President Trump should have helped Puerto Rico better in comparison. The 1 million water bottles still standing on an airport runway in the island state left aside, the corrupt Puerto Rican mayors that have since been arrested aside, this will probably be their story. This comes exactly one week after the MSM had a hallelujah moment seeing former President Barack Obama return to the forefront to criticize the current administration and take credit for the state of the economy. Please be reminded, as the MSM will tell you many times before the Midterms actually start, that this economic miracle of 4% growth we’re experiencing right now was largely due to the former White House administration. Related coverage: <a href="https://thegoldwater.com/news/36531-Obama-2016-Trump-Will-Destroy-Economy-Obama-2018-I-Deserve-Credit-For-Trump-Economy#36555"> Obama 2016: Trump Will Destroy Economy - Obama 2018: I Deserve Credit For Trump Economy</a>. In hindsight, here’s the recap: hurricane is because of Trump, economy is because of Obama. Never mind that even if climate change causes hurricanes to be stronger the 8 years of the former President are probably statistically more to blame than the 1.5 years of this one, hurricanes are caused by Trump. Never mind that even if the former administration never got anything more than 2% growth in the 8 years at the helm and this administration has gotten 4% in a year and a half, the economy is because of Obama. 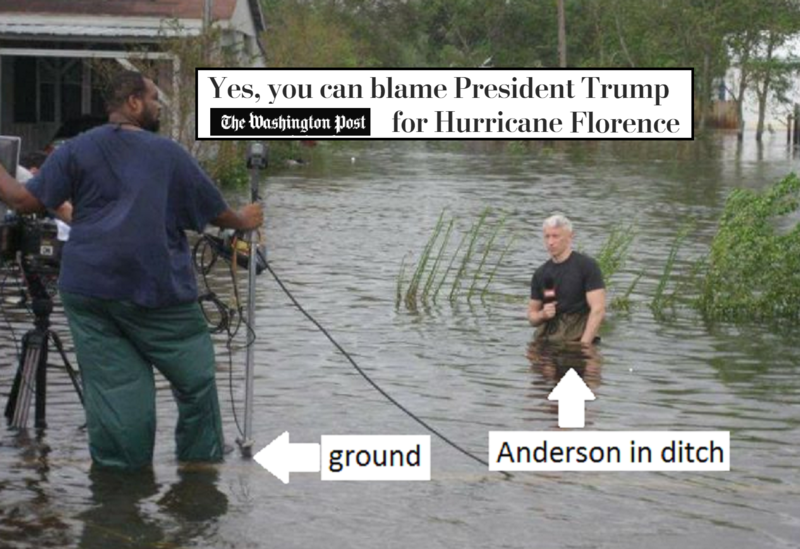 Now, why is Anderson Cooper standing in a ditch? Oh wait, he’s on CNN. They need this to come with death and destruction. Gotcha. OK Media … My cut. I look at as African/Middle-East planned terrorist attack that used liberal demanded OPEN BORDERS to gain access to the USA. Trump seeing the threat beat it down from a Cat 4 to a small topical depression with some rain and flooding. Thus in doing so Trump turned a Major Terrorist Attack, that even the Media said would have affected millions, into a 3 day Rain storm.